Engineered for unparalleled reliably, the HX350S exceeds J.I.S. Standards for waterproof at three feet for thirty minutes continuous. Building a submersible radio is no simple task! STANDARD HORIZON utilizes a high impact non-corrosive case, display lens, waterproof gasketing, and PCB's protecting with HumiSeal moisture barrier. Engineered for unparalleled reliably, the HORIZON HX350S exceeds J.I.S. standards for waterproof at three feet for thirty minutes continuous. A wet slippery hand is no problem for the HX350S because of rubber-armored grips that also protect the radio from water and physical damage. Feel the location and the action of the PTT while noticing the additional armoring around the controls and display. An alkaline battery tray and a whooping 1100mAh NiCad are standard equipment on the HX350S, the latter providing an incredible 10 hour duty cycle. Additionally, an easy to see battery shaped flag on the LCD works like a dynamic "gas gauge" indicating relative battery time remaining. Visibility is enhanced with an enormous LCD window with tall, wide digits and bold informational flags that are easy to identify. The LCD and keypad are backlit for best visibility at night. 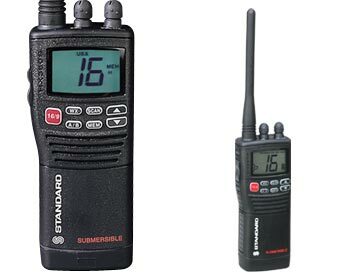 The HX350S includes accessories not found with any other VHF portable. The HX350S comes with a 110VAC charger, 12VDC charger, 1100 mAh NiCad battery, and alkaline battery tray. Because the HX350S is built better it's backed better. If your HORIZON HX350S VHF radio fails for any reason including water damage, during normal use in the first three years, STANDARD HORIZON will repair or replace it free, without hassle or charges period! Includes 110VAC, 12VDC, rechargeable Ni-Cad and AA battery tray. Built to take the day to day punishment of the marine environment. STANDARD HORIZON feels so strong about this fact the radio is backed by a 3 year waterproof warranty.